(Count Alessandro Contini Bonacossi, Rome), by July 1926; purchased April 1927 by Samuel H. Kress [1863-1955], New York; gift 1939 to NGA. The expertise for this painting is dated 16 July 1926, issued by Georg Gronau (copy in NGA curatorial files) in all probability at the request of Count Contini Bonacossi, who began to sell painting to Samuel H. Kress around that time; see Dizionario biografico degli italiani, Rome, 1983: 28:524. The bill of sale for eight paintings, including "A panel representing Scene from the Life of St. Catherine by Antonio Vivarini," is dated 6 April 1927 (copy in NGA curatorial files). Preliminary Catalogue of Paintings and Sculpture. National Gallery of Art, Washington, 1941: 212, no. 118, as Saint Catherine Casting Down a Pagan Idol. Book of Illustrations. National Gallery of Art, Washington, 1942: 241, repro. 206, as St. Catherine Casting Down a Pagan Idol. Paintings and Sculpture from the Samuel H. Kress Collection. National Gallery of Art, Washington, 1959: 127, repro., as Saint Catherine Casting Down a Pagan Idol. Summary Catalogue of European Paintings and Sculpture. National Gallery of Art, Washington, 1965: 136, as Saint Catherine Casting Down a Pagan Idol. European Paintings and Sculpture, Illustrations. National Gallery of Art, Washington, 1968: 124, repro., as Saint Catherine Casting Down a Pagan Idol. Shapley, Fern Rusk. Paintings from the Samuel H. Kress Collection: Italian Schools, XV-XVI Century. London, 1968: 31, fig. 70. Zeri, Frederico. "Un 'San Gerolamo' firmato di Giovanni d'Alemagna." In Studi di storia dell'arte in onore di Antonio Morassi. Venice, 1971: 47-48. Bisogni, Fabio. "The Martyrdoms of St. Apollonia in Four Quattrocento Panels." Studies in the History of Art vol. 7 (1975):41-47, color repro. European Paintings: An Illustrated Summary Catalogue. National Gallery of Art, Washington, 1975: 368, repro., as Saint Catherine Casting Down a Pagan Idol. Shapley, Fern Rusk. Catalogue of the Italian Paintings. 2 vols. Washington, 1979: I:537-538, II:pl. 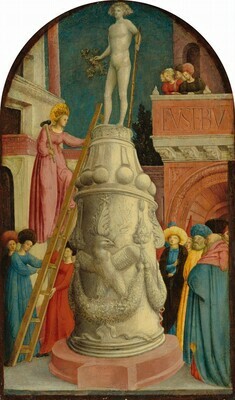 374, as Attributed to Antonio Vivarini, Saint Apollonia Destroys an Idol. European Paintings: An Illustrated Catalogue. National Gallery of Art, Washington, 1985: 426, repro. Boskovits, Miklós, and David Alan Brown, et al. Italian Paintings of the Fifteenth Century. The Systematic Catalogue of the National Gallery of Art. Washington, D.C., 2003: 316-323, color repro. Gregori, Mina, ed. In the Light of Apollo: Italian Renaissance and Greece. 2 vols. Exh. cat. National Gallery and Alexandros Souzos Museum, Athens, 2003-2004: 1:133, fig. 2, as by Antonio Vivarini.